This issue occurred for customers who didn't have the Terminology Manager included in their license and were upgrading to a server with the version 4.7 or 5.0. You should always be able to manage your users no matter what kind of license you have. But for some reason, the "Users" page was empty or unresponsive for installations that had a restricted license. We've fixed this issue and you should now be able to open the "Users" page regardless of what kind of license you have. Normally, when you want to configure tone of voice checking, you open the Dashboard and go to "Guidance Settings > Tone of Voice" or, in older installations, "Resources > Configure Voice Scores." However, if you hosted the Acrolinx server on a Unix-based operating system, this menu item was sometimes missing. This problem only occurred in combination with certain guidance packages (formerly linguistic resources). It was related to a rather vexing inconsistency in the casing of language names that we use in our configuration files. We've cleaned up the mess and hopefully this wont happen anymore. 5.0 is finally here! No, not Hawaii Five-0 — Acrolinx 5.0. It's our long awaited major release that comes with a couple of great new features like tone of voice guidance and a spruced up sidebar. There are many other changes in this release so there's a lot to cover. You might want to sit back in your favorite comfy chair before you start. To those of you without comfy chairs or time to sit back, you can jump straight to the Changes to Technology Support and Information on Upgrading sections first. Those sections have some important information about installing Acrolinx. You can read the rest later. Previously, Acrolinx gave you scores for different characteristics of your tone of voice. But if you weren't happy with your scores, it was hard to figure out which parts of your content needed improvement. We're addressing this issue by improving the guidance for each of the characteristics that make up your tone of voice. For this release, we've started with "clarity" (there's also "informality" and "liveliness", but we'll tackle those in another release). 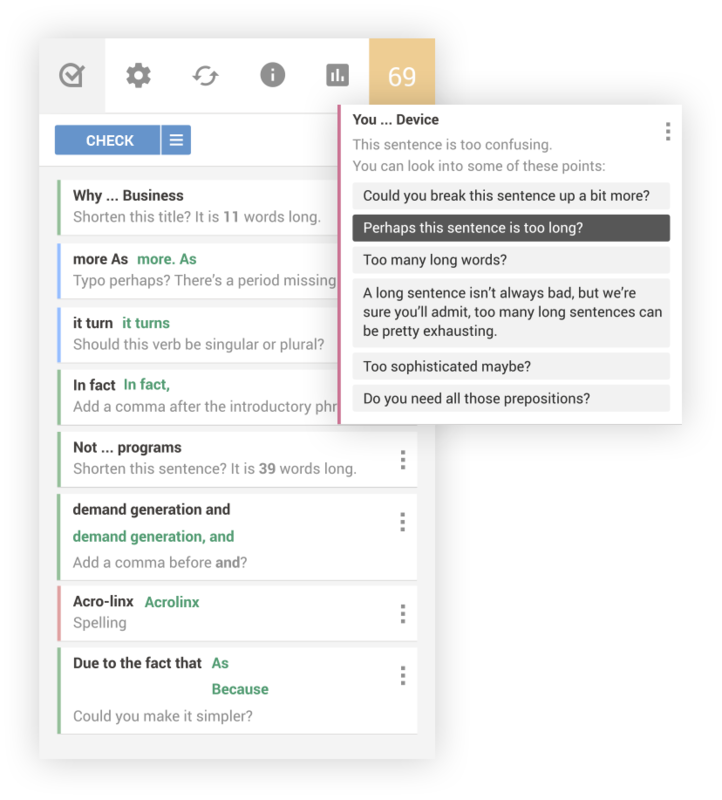 You open your editor, check your content, and in the Acrolinx sidebar you'll now see specific suggestions on what sentences you should change to get the right level of clarity. To get this new guidance, you need an upgrade to your guidance package (linguistic resources) as well as your server. To get a new guidance package, contact Acrolinx professional services. Note that you won't get this kind of guidance in the classic-edition plug-ins. This feature only works with the sidebar-edition of our plug-ins. We're constantly polishing and beautifying our sidebar, and this release is no exception. In case you've forgotten, we deliver our sidebar as part of the server now. So with this server release, you get a sidebar with a whole bunch of changes. They're too numerous to list in the server release notes, so the sidebar has its own release notes page. To find out more, you can open the sidebar release notes here. On some computers, the Acrolinx scorecard took a while to display. That's because the scorecard was an XML file that the server transformed "on the fly" with XSLT ( Extensible Stylesheet Language Transformations ). Sometimes this even caused people's browsers to crash. We've done away with all that malarkey and now we just give you the scorecard as an HTML file. So now it should display a lot faster and not crash your browser. When creating a new term entry, it's always nice to add an image that describes the term. But people who work with SVG files were out of luck. Not anymore. You can now upload images in SVG format. One thing, though: When you use Microsoft Internet Explorer 11 to upload an SVG file, something funky happens to the aspect ratio of the image. We're not sure why, but we recommend that you use another browser like Microsoft Edge to upload SVG files. To try it out, navigate to Dashboard > Users > Check Sessions and click a column header. As you'll soon see, we've dropped support for a lot of things, but that's only to clear the way for newer, more exciting technologies. This is important information though, so please make sure you've read it all before you install the Acrolinx server. Oracle stopped delivering public updates for Java 7 over a year ago. With this release, we're also dropping support for Java 7, so you'll need to install Java 8 on your server computer. If you haven't installed Java 8 already, download and install Oracle Java 8 x64 or IBM Java 8 64-bit on your server. Yes, the grand old Batch Checker must finally retire. The Batch Checker uses SOAP (Simple Object Access Protocol) to communicate with the server, but we've dropped support for SOAP. From 5.0 onwards, the Acrolinx server will reject all of the Batch Checker's attempts to communicate. This sounds kind of sad, but don't worry, we have a new tool to meet all your batch checking needs. We've called it the Content Analyzer, and you can find more details about it in the release notes . We're dropping support for Microsoft Internet Explorer 10. As of January 12, 2016, Microsoft dropped support for all of their older browsers, so we've decided to do the same. Starting from this release, we officially support the new Microsoft Edge browser — but we'll also continue supporting Microsoft Internet Explorer 11. If you've configured Acrolinx to download scorecards to people's computers, you might have received reports that the scorecard didn't open properly. The scorecard was a locally saved XML file that made the rendering process a challenge for some browsers. Variously browser bugs and security settings often interfered with this process. We've sidestepped this issue by delivering the scorecard as an HTML file. Hopefully, most of the problems that people had with opening a downloaded scorecard should now go away. People who use Internet Explorer often ran into this issue. When you edited fields on the term details page, the cursor sometimes jumped to the end of the text. This happened, for example, when you inserted a link in a text field. It was quite annoying. Hopefully, you'll never be annoyed again (by this particular issue). If you had a very long term, like 1.21-Gigawatt Plutonium-Powered Flux Capacitator for the DeLorean DMC-12, it didn't look very nice in the term search results. The term name didn't wrap and it made the layout of the search results table look rather ugly. We've fixed this now, so that the term name wraps automatically. The Translation View and the Standard View both have features for filtering linked terms by language. Both views are supposed to work independently from one another. However, the target languages option in the Translation View unintentionally affected the Show or hide linked terms option in the Standard View . For example, if you deselected all target languages except German and French in the Translation View, your selection also hid linked terms in the Standard View. We've fixed this so that the target languages option only filters linked terms in the Translation View. If you import terms from another system, the contents of your import file can contain problematic characters. If these characters make it into your terminology database, you can't export your terms again because these characters aren’t allowed in XML files (most of our export formats are some type of XML). An example of this type of character is 0x1A which is defined in the Unicode Standard as a control character with the name SUBSTITUTE. Acrolinx tries to filter out characters like this during the import process — but there were a few that we missed. We've extended our import filter to remove characters in the range 0x1A to 0x1F . If this issue affected you, you should hopefully run into far fewer problems like this. If you have a term that contains several words, you can tell Acrolinx which word is most likely to be inflected. You select that word, and Acrolinx will check for inflected forms. For example, suppose that you have the term secured area and you want Acrolinx to suggest unendangered area . You can select the term area to make sure that Acrolinx can detect the plural form secured areas and suggest unendangered areas. However, this didn't always work. Acrolinx would sometimes suggest unendangered area (singular) for the term secured areas (plural). We've fixed this issue so that Acrolinx always suggests the correct form. Some of you reported that the Acrolinx scorecard contained incorrect spaces and line breaks, which made it an unpleasant sight to behold. We've fixed this issue so that the scorecard now looks a little nicer. We're changing our product terminology because we're reaching new people. A lot of people who create technical content use Acrolinx. That's not going to change, but people from other departments — such as marketing and support — are using Acrolinx too. We've noticed that some of those people are a little intimidated by our universe of technical terms — and let's be honest, how many of your nontechnical friends know what deprecated means? Linguistic Resources Guidance Package Linguistic Resources sounds like academic jargon. We’re so used to it, we’ve forgotten how it might sound to people who’ve never heard of us. We think guidance package might give people a better idea of what this component does. It's different types of writing guidance, codified into software files, that we bundle into a package. So we now call it a guidance package. Resources Guidance Guidance refers to any information that helps to guide your writing. Our product provides this information in different ways. For example, Acrolinx provides word guidance, terminology guidance, style and grammar guidance. With this release, Acrolinx also provides tone of voice guidance. Rule sets Writing Guides People who write style guides don’t generally talk about rule sets. It’s a term that we came up with because it suits the way our technology is put together. But we needed a term that reflects the goal of the product rather than the structure of the technology. Rules Guidelines The term rule reflects the binary, computational nature of our product just fine. But in real life, language isn’t quite so cut-and-dry. Rules are fluid and the boundaries between proper and incorrect usage are changing all the time. We chose the term guideline to reflect that language is always changing and rules are always going to be broken. Quality Score Acrolinx Score This term isn’t new, but we want to reinforce the correct naming. Product managers have called it the quality score, marketers have called it the Acrolinx Score (yes, we too struggle to speak with one voice sometimes). But we all agree that we want to emphasize the uniqueness of our score. There might be other products out there that produce quality scores but we think that our score gives you a more comprehensive view of your content quality. So we call it the Acrolinx Score to set it apart from other kinds of scores. Voice Tone of voice This is a small change, but we hope it makes things a little more precise. When used on its own, the term voice can be a little ambiguous. There's other software that works with voice, but they're often talking about something completely different — like voice recognition. In our software, we want to make it clear that we deal with tone of voice. And lastly, we want to say something to all the Acrolinx veterans out there. Yes, this is a pain in the neck. We've turned your Acrolinx world upside down. You've gotten used to talking about rule sets and rules and we don't blame you if you feel a little frustrated by this change. But most companies (and people) redefine their identity at least once in their lives, and we're no exception. We've rebranded the look and feel of our products and website, and now we need to adapt our tone of voice to match it. We've tried not to throw too many terminology changes at you at once. This release contains naming changes to the core concepts in our product. In previous versions of the Acrolinx server, you might have noticed the "Rule Documentation" link on the language servers page. In Acrolinx 5.0, we've removed this link. This link opened an automatically generated document that summarized all the guidelines in your writing guides. We removed this document because it was difficult to automatically generate it in a format that was readable and easy to follow. If you still need this information, contact our professional services team and we'll see what we can do. Previously, if you built a custom integration for Acrolinx and wanted to check PDF files, your integration had to convert the PDF file into a compatible format first. Now, you can just send the PDF file. We've integrated Apache PDFBox into our server so that your integration can check PDF files on the server side. We've changed the contents of the file coreserver.wrapper.conf to remove references to the old temporary directory. If you've created an overlay copy of file coreserver.wrapper.conf in your configuration directory, you'll need to change it yourself after you install the new server. For example, you might have created an overlay copy if you use the IBM JDK . If you do have an overlay copy, remove the reference to the old temporary directory. The reference should look like this: wrapper.java.additional.4=-Djava.io.tmpdir=../tmp . Remove this line before you start your new server for the first time.